For consumers and professionals alike, a digital camera offers convenience and immediacy. But when youre using one to shoot a movie or TV drama theres an extra consideration: the way the captured image looks. In previous generations, high-end dramas were shot on film. These days, regardless of budget, (and because of the need to shoot quickly) most TV programmes are shot digitally using cameras that produce sharp images. But sharp isnt always the look that is required creatively. To get a look that takes an audience back in time, for example, DoPs are increasingly turning to older, vintage lenses. Without the lens a camera is just a sensor, and more than anything else its the lens that really defines the personality of a camera. Lens design is a balance of compromises. On one side there are factors like cost and weight. On the other there is speed, resolution, aberrations, flare, all the many distortions that can impair an image. For some genres, like sport, a high resolution will be called for, with few aberrations. For episodic productions, generally the realistic look is called for, so again, high performance with low distortion. However, for some prime movie production and television drama, the gritty realism of modern lenses and cameras is an anathema. For the audience to become immersed in the story, to suspend the present and enter a world of the imagination, a softer dreamier look is called for. Part of this is the 'film look', a term that defies an objective definition. As DoPs and directors search for a distinctive style for their latest creation, many hanker after the look of their favourite old movies. Recently I was talking to a DoP about his experience with a new 4k camera. His initial fears were that the camera would be too sharp. His goal was to make the actors look as good as possible. Close-ups in 4k can be very revealing, every skin pore is visible. Now its just fine to show sweat running down the face of a boxer or front row forward, but in a romantic drama, its not appropriate. We end up with the lens designers designing sharper and sharper lenses, and DoPs using diffusion filters to lose resolution. The film processes naturally lost resolution, with intermediate negs and positives before the final release print, which has a resolution equivalent to around 1000 lines or so. Couple that with less sophisticated lens design, and the look was quite soft and diffused. In the quest to mimic the look of some of the classic movies, DoPs are mounting vintage lenses on the latest digital cameras. 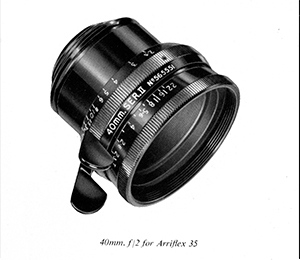 Since 1982, when ARRI announced the PL mount, most lenses were supplied with that mount, so they can be fitted easily to a modern digital camera. Older lenses just require an adaptor, easy to buy from specialist film engineering workshops. Why not fix it in post? So many distortions and filters can be added in the edit. The aberrations of vintage lenses is subtle. Some of the sought-after looks stem from the veiling glare in older lenses, which reduces contrast and shadow detail. Each lens has its own way of reproducing out-of-focus highlights: the bokeh. Another aberration is found in anamorphics. These lenses have a cylindrical element to squeeze the picture horizontally, to be expanded back out on projection. They suffered from a horizontal lens flare on highlights, a signature effect of Wes Anderson. The bokeh are elliptical rather than the circular as with a conventional lens. In the quest for these many aberrations DoPs are using older optics to get a period look. Favourites are many of the classic Cooke lenses, the Speed Pancros, S2/S3, and S4i sets. Bausch & Lomb Super Baltars are another popular vintage lens, they were used on The Birds and The Godfather. Many budding DoPs may not realise that Canon made a line of cine lenses back in the 1970s, the K-35, winning an Academy award for the design. Available in focal lengths from 14 to 200mm they remain sought after today. They were notably used on Aliens (1986). In 2015 Azule Finance brokered a £36,000 deal that saw these very lenses bought for use on future digital projects. Its not just DoPs looking at these old lenses either. Budding DSLR users may find new lenses too expensive, but the demand is pushing up the price of the older classics. They were built to last, and built to be serviced so they are still very much usable today. 4k may be here to stay, but it is a little too sharp for some genres. A vintage lens can provide just the personality to give a production the look the director is seeking.